May the special power-ups be your aid along the way! 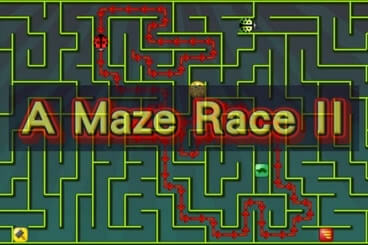 In this game you will be racing against the computer in randomly generated mazes, and your goal is to reach the yellow food before the computer does. At each level of the game you will control a red ladybug, while the computer will be represented by a green bug. Use the four arrow keys on your keyboard to move the bug, and you can pick up the special items in the maze and use them to your advantage. The powers of the items are as follows: the red wing will increase the moving speed of your ladybug, the green tortoise will slow down your opponent, the blue arrow will show the correct route to reach the food, and the yellow hammer will let you break a part of the wall by pressing the Space-bar on your keyboard. As you advance in the game, the computer will move at a faster pace, and if it takes the food before you do, the game ends. Utilize the power-ups wisely and help your ladybug to reach the target! How to play "Maze Race II"
Use the Arrow Keys to control the red ladybug to get to the food before the green ladybug does. On the way there are some items which you can pick.